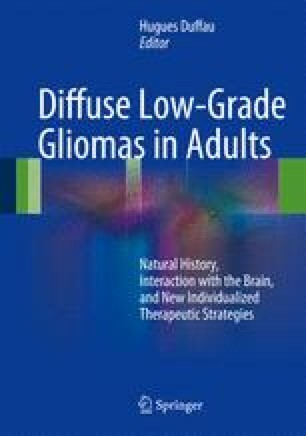 MRI is currently the method of choice for the diagnosis of diffuse low-grade gliomas and provides an excellent depiction of structural changes in the brain. Nevertheless, the delineation of the tumor from normal brain tissue and nonspecific abnormalities on MRI such as edema- or treatment-related changes can be difficult. Positron emission tomography (PET) provides additional information on tumor metabolism and is helpful in many clinical situations. In particular, PET using radiolabeled amino acids has a wide range of applications and helps to solve a number of clinical issues. At initial diagnosis, amino acid PET may be helpful to estimate the prognosis of a low-grade glioma and to decide on the therapeutic strategy. The method improves targeting of biopsy and provides additional information of tumor extent which is helpful for planning neurosurgery and radiotherapy. In the further course of the disease, amino acid PET allows a sensitive monitoring of treatment response, the early detection of tumor recurrence, and an improved differentiation of tumor recurrence from treatment-related changes of the brain tissue. In the past, the method had only limited availability due to the low number of PET scanners and the use of radiopharmaceuticals with a short half-life. In recent years, however, the number of PET scanners in hospitals has increased considerably. Furthermore, novel amino acid tracers labeled with positron emitters with a longer half-life have been developed and clinically validated which allow a more efficient and cost-effective application. These developments and the well-documented diagnostic performance of PET using radiolabeled amino acids suggest that its application continues to spread and that the method may be available as a routine diagnostic technique for certain indications in the near future.